Relax in the beautiful countryside enjoying the Country Lodge facilities. Visitors can sample the succulent farm raised venison – once tasted, never forgotten! Just north of the Waipara Valley is the small settlement of Greta Valley. Set amongst the rolling hills is the home of Lovat Venison and the Lovat Downs Bed and Breakfast Country Lodge. 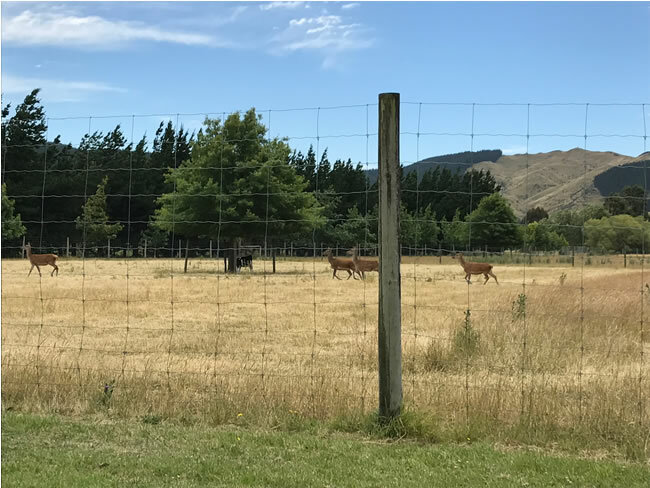 Ideally placed on State Highway 1, it provides easy access to the surrounding tourism destinations and wine district, without the hustle and bustle of typical holiday settlements. Your host, John Douglas, is a long-time deer farmer and is well-regarded in Crusader country for his good old Kiwi hospitality and thoroughbred racing pedigree. With a 1km-long driveway, we can offer our guests the luxury of complete peace and quiet with no audible traffic and no visible streetlights, despite being located on State Highway 1. Within a beautiful character home, built with Alexander Schist from Otago, all our four guest bedrooms are large, giving you ample space, with your own ensuite. Lovat Downs Country Lodge Bed & Breakfast sits amid a fully-working 140-hectare deer farm, the home of Lovat Venison. We have been running a venison business from our farm for the last ten years. Professionals agree that the best tasting meat is that coming from animals that have been farm raised in a stress free environment. Lovat Downs is an ideal base from which to try out the region’s wide range of attractions – from the hot pools and skiing in Hamner, to the wine trails and vintage railway in Waipara, to the crayfishing at Motonau Beach. If you are looking for a special romantic getaway, we are just down the road from the famous Tipapa Woolshed wedding venue. Venison from the farm at Lovat Downs is raised in a natural, free-range environment, with open pastures, fresh grass and room to roam. Our venison has all the flavour without the fat, is rich in iron, essential vitamins and minerals, making it the ideal meat to include as part of a balanced diet. New Zealand farm raised venison is tender and delicious and can be adapted to a wide variety of cooking styles. Professionals agree that the best tasting meat is that coming from animals that have been farm raised in a stress free environment. Venison has virtually no fat or cholesterol and is widely regarded as one of the healthiest red meats. New Zealand's hi-performance sports men and women have identified that venison is an excellent source of iron as well as being high in protein. It’s also one of the safest meats you can eat, without the worries of infection or disease. Lovat Venison is produced from the deer raised on the open pastures of Lovat Downs, in a natural, free-range environment without the use of hormones or steroids. It’s naturally healthy too, being low in fat, calories and cholesterol and with a great taste that has to be experienced. Why is New Zealand farm-raised Venison so good? It’s lean – Venison from young deer contains virtually no fat. Common retail cuts are 97-99% fat free – so it provides high quality protein with very little fat. It’s delicious – Venison from New Zealand’s farm raised deer does not have the strong ‘gamey’ flavor that many find off-putting. A grass diet, careful selection and world’s best processing means that New Zealand venison is a culinary treat. It’s so easy to cook - Farm-raised venison requires virtually no preparation. Take the meat from the packet, sprinkle with a little pepper, cook to medium rare – serve and enjoy – No fuss and no waste. Not sure how to cook it? The New Zealand Venison website has hundreds of recipes, videos, and easy-to-follow instructions. Lovat Downs B&B Country Lodge and 140ha Deer Farm is located just one hour North of Christchurch, New Zealand. A relaxing and welcoming place to stay, it is also the source of Lovat Venison, a naturally free-range, farm-raised, uniquely healthy and low in fat high-quality meat. © 2018 Lovat Downs. All rights reserved.